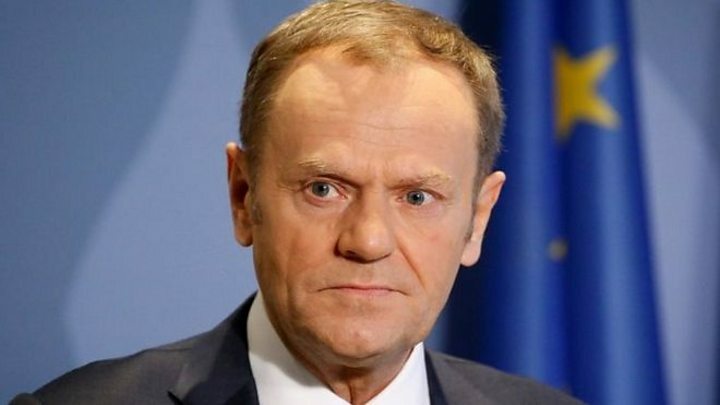 Donald Tusk has insisted the EU “does not want to build a wall”, but Brexit means “we will be drifting apart”. The EU Council president said Theresa May wanted to “demonstrate at any price that Brexit could be a success”, but that was not the EU’s objective. He was unveiling draft guidelines for the EU side for negotiations on post-Brexit relations with the UK. Mr Tusk said the EU wanted an “ambitious and advanced” free trade agreement with zero tariffs on goods. But, he added: “Our agreement will not make trade between the UK and EU frictionless or smoother. He said it would be the first time in history that a free trade agreement would “loosen, not strengthen, economic ties”. The draft European Council guidelines call for zero-tariff trade in goods. The document also says access for services will be limited by the fact that the UK will be outside the EU and will no longer share a common regulatory and judiciary framework. The draft guidelines repeat EU warnings that there can be “no cherry-picking” of participation in the single market for particular sectors of industry – although it does not mention financial services by name. Existing reciprocal fishing rights for EU vessels in UK waters should continue, it states, and there should be “appropriate” customs co-operation. 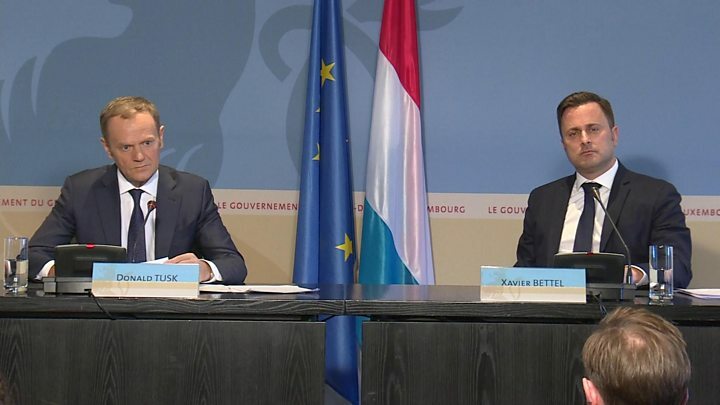 Mr Tusk said he wanted continued security and research cooperation and to ensure flights were not grounded. The draft guidelines also say that the EU will “preserve its autonomy as regards its decision-making, which excludes participation of the United Kingdom as a third-country to EU Institutions, agencies or bodies”. Mrs May acknowledged in her Mansion House speech on Brexit on Friday that neither side would get everything they want from negotiations. 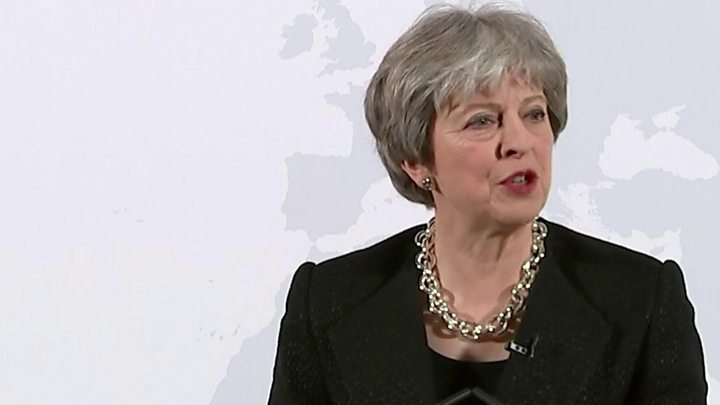 But she also stressed that the UK wanted a bespoke trade deal, rather than an “off-the-shelf” model. “The fact is that every free trade agreement has varying market access depending on the respective interests of the countries involved,” she said. This appears to be in conflict with the EU draft guidelines, although BBC Research has found several examples of non-EU members participating – as a member or observer – in EU agencies and bodies, such as the European Environment Agency and the European Medicines Agency. UK Chancellor Philip Hammond has told European leaders that it is in the “mutual interest” of both the UK and the EU to include financial services in a free trade agreement. But Donald Tusk flat out rejected the UK proposals. Donald Tusk unveiled his guidelines in a picture-perfect castle in the hills outside Luxembourg. A nice change to the usual venues in Brussels but the same tough message from the EU that the UK’s red lines limit what it can get from the final Brexit deal. The best that’s on offer is a free trade agreement on goods with no tariffs, and access to the European markets for the UK service sector – but under EU rules and with no specific mention of financial services. I asked a sad-sounding Donald Tusk if his offer came anywhere close to what the prime minister had asked for in her Mansion House speech. His pause was epically long, which suggested he knows it is not. His document is also pretty gloomy, with a spine-chilling warning about the economic costs to the UK. But there is also a big offer tucked away in a later paragraph – there are other options available if the government is prepared to compromise on its red lines. The leaders of the remaining 27 EU states must approve the plans at a Brussels summit on 22 March, setting the template for chief negotiator Michel Barnier for talks with the UK about their future relationship. The UK is due to leave the EU at the end of March 2019, and both sides have said they would like a deal on their future relationship to be agreed by this autumn to allow time for parliaments to approve the deal before Brexit happens. But the European Council “confirms its readiness to initiate work towards a free trade agreement (FTA), to be finalised and concluded once the UK is no longer a member state”. The European Parliament has stressed that its preferred option is for the UK to continue to be a member of the single market and customs union after Brexit, in a draft resolution, leaked to the Politico website. The parliament does not have a formal role in the Brexit negotiations but does have a veto on the final deal. The European Parliament document, which may be changed before it is adopted, says non-EU members – even if very closely aligned to the bloc – cannot expect the same rights and benefits as EU members. It also warns that the UK’s current “red lines” in Brexit talks “would lead to customs checks and verification which would affect global supply chains and manufacturing processes, even if tariff barriers can be avoided”. It says a “deep and comprehensive” trade deal, of the kind envisioned by Theresa May, must entail “a binding interpretation role” for the European Court of Justice. MPs in Westminster are, meanwhile, debating a call by Plaid Cymru – who have four MPs in Wales – for UK nationals to be allowed to keep their EU citizenship after Brexit. Plaid said EU citizenship would give holders the right to travel, live, study and work anywhere in the EU even after the UK leaves next year. A UK government spokesman said only citizens of EU member states could hold EU citizenship.